Mimaki, a leading manufacturer of wide-format inkjet printers and cutting systems, today announced its powerful presence at Texprocess and the parallel show Techtextil 2017 that will highlight Mimaki’s wide-format digital textile printers and innovate ink and dye sublimation technologies in two separate exhibition halls. Key presentations will be given by Mimaki Deutschland GmbH representatives in the Texprocess Forum and the inaugural European Digital Textile Conference. Texprocess serves the international garment-manufacturing and textile processing industry while Techtextil brings together technical textiles and nonwovens showing the full range of potential uses of textile technologies. Both international trade fairs will take place 9 to 12 May, 2017 at the Messe Frankfurt in Frankfurt am Main. During the Texprocess trade fair, the Digital Textile Micro Factory will present a live demonstration of an integrated production chain for apparel in hall 6.0, stand B57. In collaboration with the German Institutes for Textile and Fibre Research in Denkendorf and a number of well-known companies in the textile sector, the micro-factory will demonstrate the entire networked production of clothing items – from the design stage to digital printing, automatic cutting out and fabrication. The Digital Textile Micro Factory will focus mainly on sport apparel. Mimaki will show its TS300P-1800 with sublimation inks and the Tx300P-1800 printer with pigment inks during the large-format inkjet printing step of the micro-factory, involving sublimation printing on polyester and pigment printing on cotton and mixed fibres. Both developed for the textile print industry, the revolutionary TS300P-1800 wide format, high-speed dye sublimation textile printer delivers cost-effective printing while maintaining high quality and productivity and is designed to print onto the thinnest of transfer paper. The Tx300P-1800 direct textile inkjet printer delivers high-quality printing on a wide range of textiles and is ideally suited for applications such as fashion, furnishing, soft signage and exhibitions. Experts from the fields of science and business will present the latest knowledge on subjects of topical interest to the sector in over 30 lectures and panel discussions during the Texprocess Forum. Programme highlights include: textile finishing, digital printing, sustainability, and product-lifecycle management. Michael Wartmann, Product Manager Textile of Mimaki Deutschland GmbH, will present “Various Textile Ink Technologies for Interior Design” on May 9, 2:55pm in hall 6.0. The presentation will be followed by Wartmann’s participation in the panel discussion: “Drivers for future growth of digital textile printing in technical textile applications?” at 4:25pm. The first-time European Digital Textile Conference, organised by the World Textile Information Network (WTiN) in collaboration with Texprocess and Techtextil will take place in hall 4.0, Saal Europa on May 10 from 09:00am to 4:30pm. Focus topics of the conference will be the latest product developments and the advantages of using digital printing technology for functionalisation and decoration of technical fabrics. During the conference on May 10, Mimaki will lead a roundtable discussion at 12:05pm. In addition, Uwe Niklas will present “High Speed Dye Sublimation Printing” on May 10 at 11:40am. In this presentation, he will explain the difference between sublimation transfer and direct dye sublimation printing, and how each technology can be beneficial for home textiles and interior design will also be discussed. 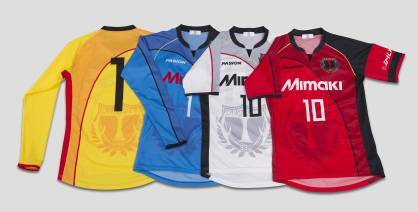 At Techtextil, Mimaki will also demonstrate its Tx300P-1800 with sublimation ink in hall 3 stand D05, together with its authorised dealer Multi-Plot Europe GmbH.